Have you ever wondered how an interior designer’s home looks like? And how they decorate? Then meet interior designer, Jenni, who later in this post reveals her tips. Her beautiful home is to die for, and she has a secret talent. 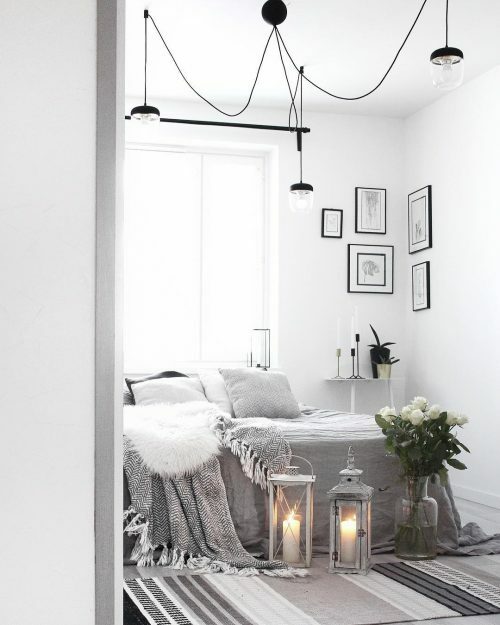 How do you like the casual way her lamp wire drapes off the ceiling along with the poster wall corner and the cosy plaids in the monochrome styled room? 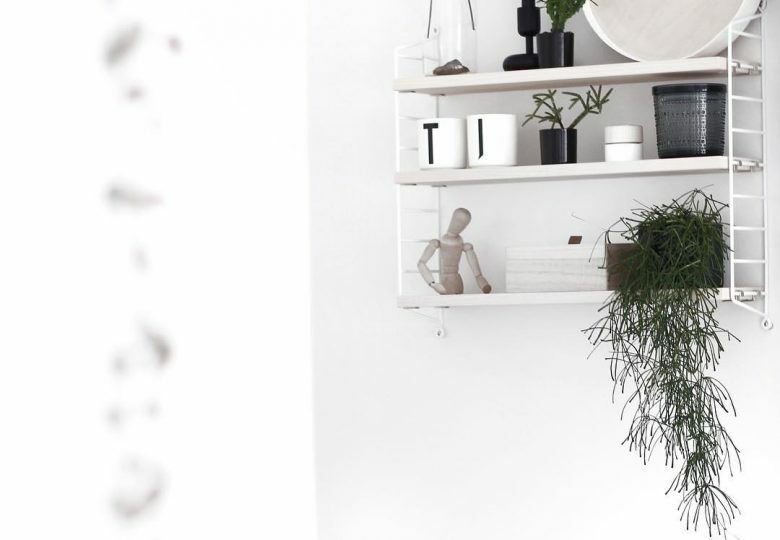 I love this wooden shelf with the black metal black pottery and lovely green plants. How do you you like the gorgeously handpainted picture made by Jenni herself? In fact, lots of her paintings, she has painted herself! Just like these ? And you can soon purchase her art on her webpage ? So you can capture her style without having to be the next Picasso? 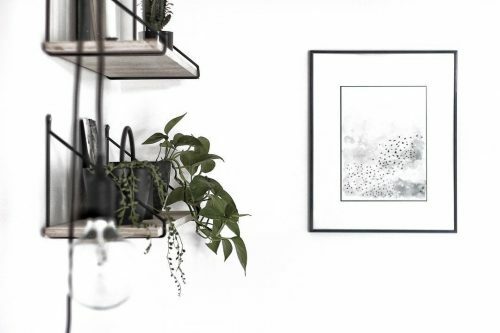 This is an amazing example of her light, effortless style with black and white colours mixed with wooden elements, plants and her stunning paintings ? I think my interior tips are.. umm hard to say ? I really know what my style is. I don’t buy any stuff if I am not sure they have a spot at our house. I don’t change my decorations, such as pillows, curtains or rugs, for every season, I like to keep this home clear and in harmony all the time. I don’t really follow trends that much. 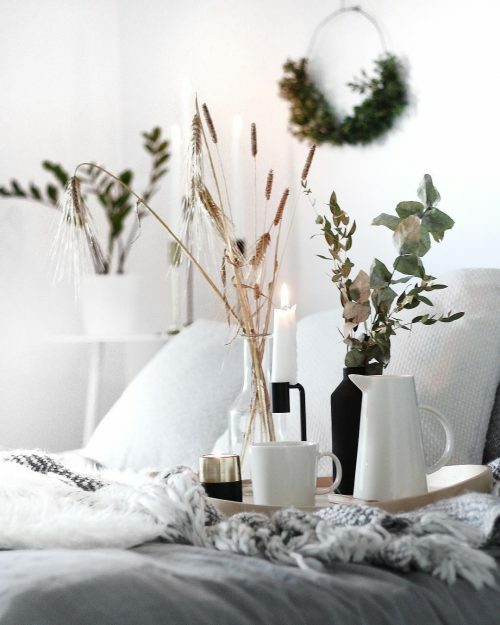 I want to keep my own kind of scandinavian style. I get to see so many different styles at work and I guess that’s why I want to keep my home pretty simple. I have tried colours but they are not for me. 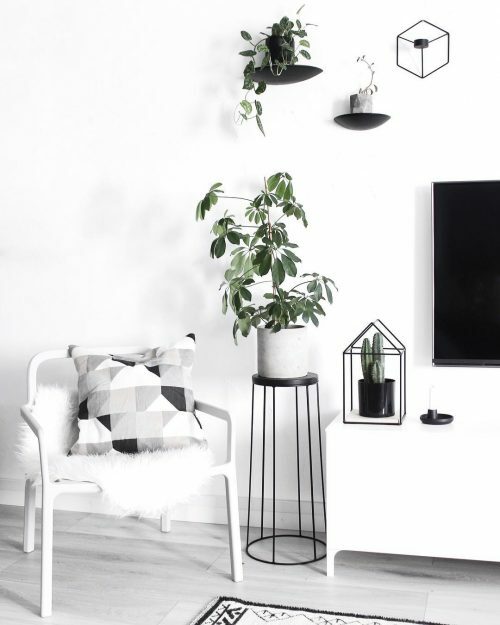 But I don’t like the typical black and white interior at all, I want to add colours by using plants and wooden elements. 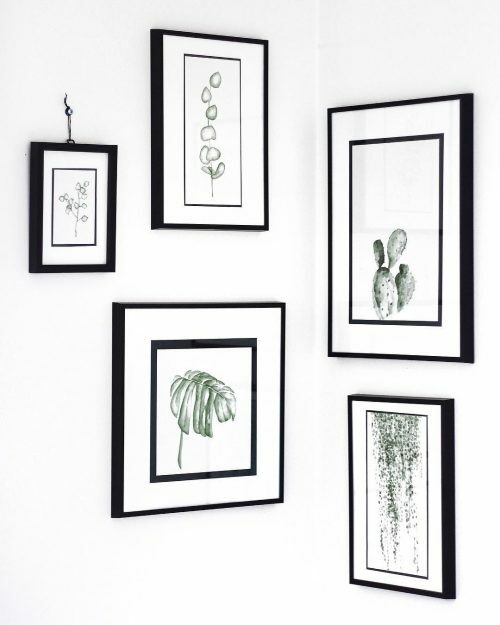 And to make the interior more interesting, I like to use frames in different sizes and a variety of shapes to decorate with, to mix it up. 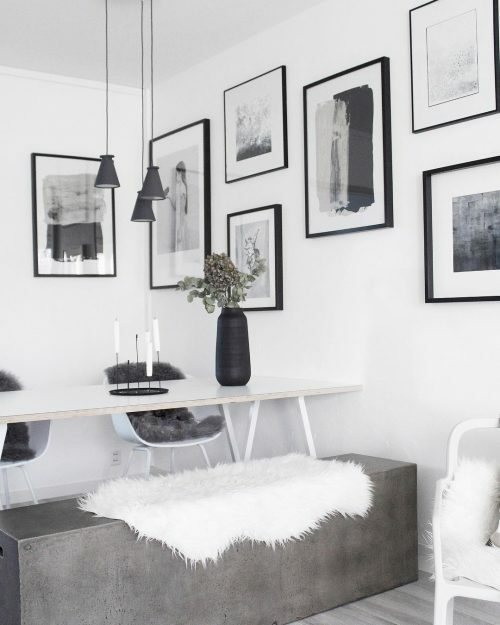 For a styling tip she says: Try to create a picture wall with two adjoining walls in a casual, scattered way – like in the pic below. Her interior guideline is the Konmari method. Konmari is the Life-Changing Magic of Tidying Up: The Japanese art of decluttering and organizing. I have been konmared a lot! I want to keep everything in control. Even the things that are hidden in the closets. 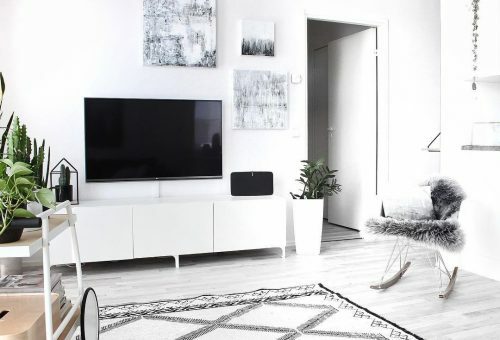 So after all I think I want my home to be clean, clear, scandinavian, minimalistic, interesting and the most important: to be a perfect place to live, love and stay! 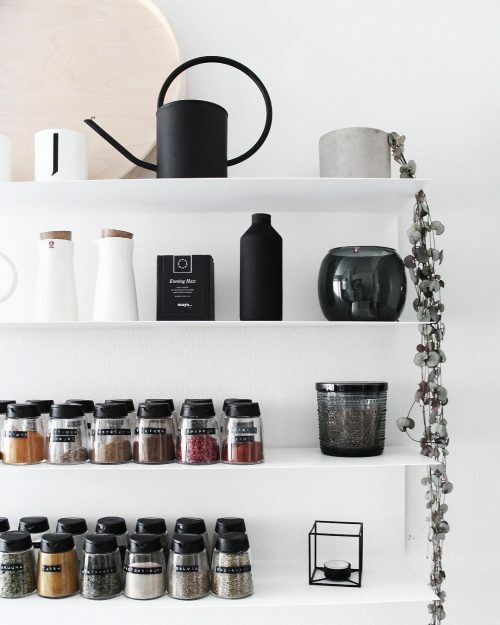 Look at the tidy and beautifully styled spices shelf. If you want a home like hers, go through your belongings and keep only what makes you happy before organizing everything. Read more about this method here.